A pair of 2013 draft prospects, Seth Jones and Ryan Hartman, have been selected to participate in USA Hockey's 2012 National Junior Development Camp, taking place August 4th-11th in Lake Placid, NY. Key members of the US squad that captured gold at the IIHF U18's back in April, the 17-year olds will now get a look as Phil Housley and his staff begins formulating their entry into the 2013 World Junior Championships, which kicks off the day after Christmas in Ufa, Russia. The duo share a similar distinction in that they both have opted of out the NCAA route to instead continue their development in Canadian major-junior. 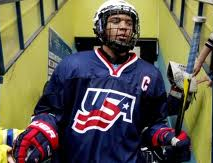 The 6'3 Jones, a native of Texas, will patrol the blueline for the WHL's Portland Winterhawks in 2012-13, while the scrappy Hartman spurned Miami University for the Plymouth Whalers. The entire camp roster and schedule, including games with teams from Finland and Sweden, can be found at the USA Hockey website.